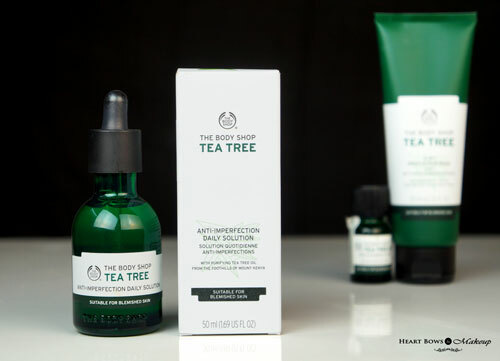 TBS recently invited our team to the launch and revamp of their new Tea Tree Range. Having had troubled skin all my life, their Tea Tree Oil has been my saviour hence I was really excited to try out their new products. It is said that TBS sells tea tree oil every 8 seconds which goes on to prove its efficacy and popularity amongst the users. They not only revamped their packaging but also launched 2 new products: The TBS 3 in 1 Wash Scrub Mask & the Tea Tree Anti Imperfection Daily Solution. Read on for the detailed review and our must haves from the range. The new TBS 3 in 1 Wash-Scrub-Mask is packaged in a tall opaque squeezy tube with a flip open cap. The tube has all the necessary details like the list of ingredients, date of expiry, price etc. The product comes out easily from the nozzle and is travel friendly though I do wish they came out with a travel sized variant as well. I’m not a huge fan of multi tasking products especially a scrub and mask in one, since in my past experience these products fail miserably as both. However, The Body Shop Tea Tree 3 in 1 has been a pleasant surprise. It claims to work well as a face wash, scrub and a mask and I have to admit it is pretty darn good. It has a thick and creamy texture with fine exfoliating particles which unclog the pores really well. I usually apply it as a mask, let it dry and after moistening my face a bit, I use it as a scrub in circular motions. It contains tea tree oil to purify the skin, kaolin clay which mattifies and reduces shine and perlite, a natural mineral which exfoliates the skin well. The skin feels clearer, brighter and softer from the first use itself and I have noticed that my whiteheads and blackheads have greatly reduced with regular usage. This is definitely the best product for combination-oily skin especially as a scrub. If there is only one product you can pick up from the range, then it should definitely be the 3 in 1 wash-scrub-mask. 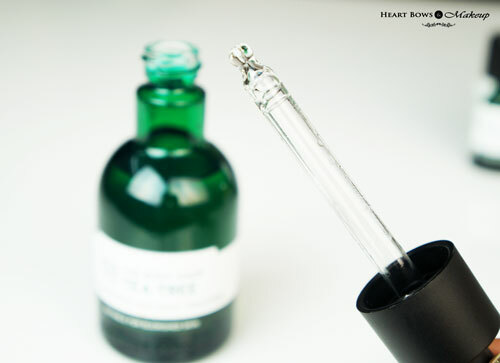 The green glass bottle comes packaged in a white cardboard box. It comes with a dropper which helps to control the amount needed. I usually need a half a dropper for my entire face and neck hence a little goes a long way. TBS calls their Anti Imperfection Daily Solution as a ‘pre-serum’ which means it needs to be applied after washing your face and before your serum. 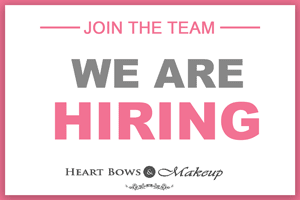 It has a very lightweight and water-y consistency which absorbs easily into the skin. The product has a light tea tree scent which can be a bit strong if you’re not used to it but it dissipates after application. Its key ingredient is 100% community trade tea tree oil which helps to fight blemished and acne prone skin. I have been using this once a day at night for the past one month and my skin has never looked better. It feels smoother, clearer and the shine, especially around my T-zone has reduced greatly. 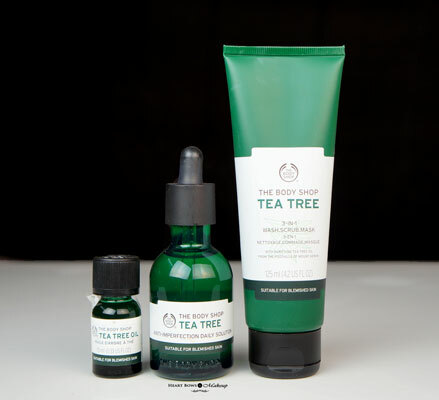 The TBS Tea Tree Anti Imperfection Solution has also helped with my whiteheads, making the area around my nose feel much smoother since it was quite bumpy earlier. Due to the lightweight consistency, I think this is suitable for skintypes especially those with oily skin however Lisha who has dry-normal skintype, felt it was a bit too too harsh on her and dried her skin a bit. Hence, for those with dry-normal skin, I’d recommend using this 2-3 times a week only. This is another great product which has been added to the range and gives great results. Targeted care for blemished skin. Can be used direct on skin. 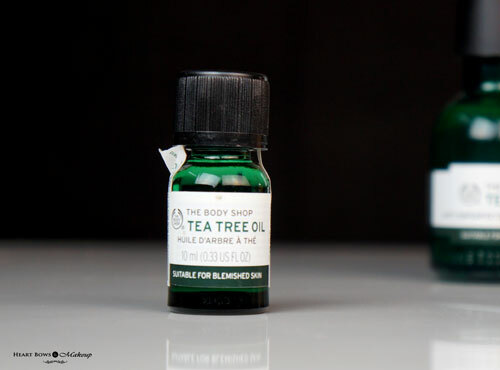 The TBS Tea Tree Oil comes in a new revamped packaging in a small glass bottle with a lock mechanism screw on cap. To open it, one needs to push the cap a little and then screw it around. Despite the glass packaging, I find it very travel friendly and convenient as the product will not leak in your bag and the bottle hasn’t broken yet. It contains 15% tea tree oil and feels very light unlike some oils, like coconut oil for instance. 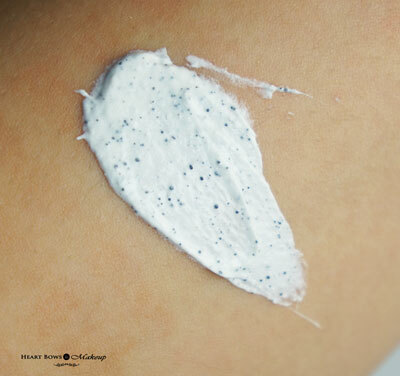 It has a watery consistency and is supposed to be used as a spot treatment. Anyone, who has battled acne in their life would know what a boon this is for troubled skin. I’ve been using this for more than 4 years now and every time I get a zit or pimple, I just dab some tea tree oil and it gets minimized in just a day! It also helps in reducing pesky acne scars and can also be used in face masks and moisturizers by adding just a drop or 2. 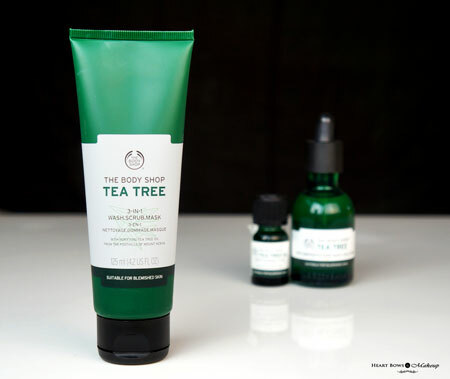 The tea tree oil does have a slightly strong scent which might bother those with a sensitive nose however its amazing results make it all worth it. The price has been hiked since the last time I bought but a little goes a long way and one bottle will easily last you years. 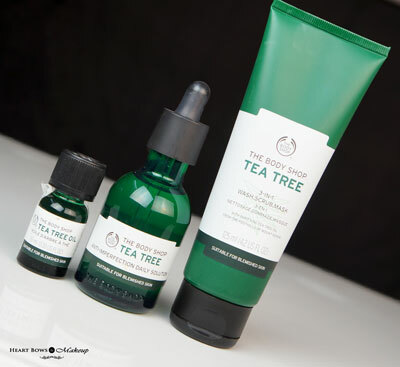 HBM Recommendation: The Body Shop Tea Tree range is an amazing line that works wonderfully for blemished and acne prone skin. It not only makes the skin clearer but also reduces whiteheads, blackheads and the appearance of pores. With the addition of the Anti Imperfection Daily Solution & 3 in 1 Wash-Scrub-Mask, it is totally worth trying! DIY: Easy Diwali Diya Hangings- Step by Step Tutorial! Best Long Lasting Lip Glosses in India: Our Top 10!